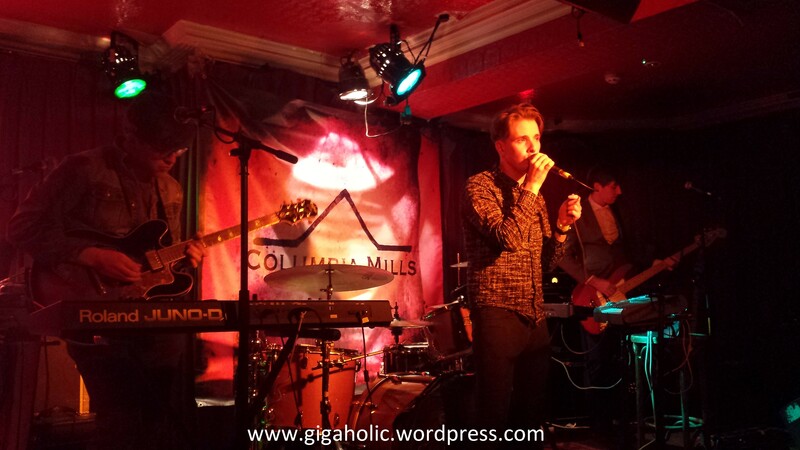 Columbia Mills (called Empire Saints in a previous life) debuted their first EP upstairs in Whelans and I went along for Ceol Collective. Really impressive opening – dying to see them again to be honest. And their support act Dear Desert are definitely ones to watch as well. Columbia Mills started as they mean to go on by selling out their debut headline gig in Dublin, upstairs in Whelans, where they launched their new EP “Factory Settings”, with support from the exciting Dear Desert. Watching Columbia Mills smash out one song after another to a packed room, it seems like they have been around forever. This is likely helped by their indietronic sound which is a delicious melting pot of 80s and 90s influences and manages to sound both completely new and utterly familiar. Support act Dear Desert opened the night with an explosion of synths, deep rhythms and soaring falsettos, impressing the growing crowd. Having recently launched their own EP “Give it Up”, Dear Desert almost stole the show from the headliners with their accomplished sound which hints at impressive things to come. I highly recommend checking them out (here https://soundcloud.com/dear-desert). But Columbia Mills were never going to allow themselves to be surpassed by their brilliant support act. Opening with the distorted vocals and heavy beats of “The Perfect Day”, they clearly stated their intent to be recognised as an exciting new addition to the live music scene. It is apparent that they are not an act who have rushed their EP release – apart from their cover of The National’s “Sorrow” which did the original justice while making it their own, the set consisted of original songs. These Bray natives seem to have far more tracks ready to go than just the four included on Factory Settings, so it is likely that we’ll be getting another release in 2015. Standout tracks on the night were the encore set of “Bass Soup” followed by current single “Never Gonna Look at You the Same” which highlights the band’s ability to resist relying on the more electronic influences of the rest of the set and to produce a radio-friendly single while maintaining their distinctive sound. A brilliant debut, it seems likely that this is only the beginning for Columbia Mills.